We are right in the middle of the hottest part of the summer. The early spring bloomers are finished and now it is time for the tough summer blooming plants to be the stars in the garden. Summer blooming plants have to be able to withstand the high temperatures that come with summer. They also need to be able to make good use of whatever water supply that is available to them. In some areas of the country that can be little to no water for days on end. If you want non stop color in your garden all summer (and into the fall for some of them), try planting these tough summer blooming plants. Even though most of these plants are grown outdoors, many also fit into the classification of flowering houseplants and can be grown as indoor plants if you have the right light conditions in your home..
My southwest facing garden is in full bloom right now. Everywhere I look there is a splash of color. Yours can be, too, as long as you take care to keep on top of a summer garden tasks. Be sure the plants get extra water in the driest weeks, keep on top of weeding and be sure to trim off spent flowers. One of the biggest reasons that gardens stop flowering in mid summer is that the dead flowers have not been removed. A few minutes doing this task each week and a variety of these summer blooming plants will ensure that your garden stays colorful right into fall. 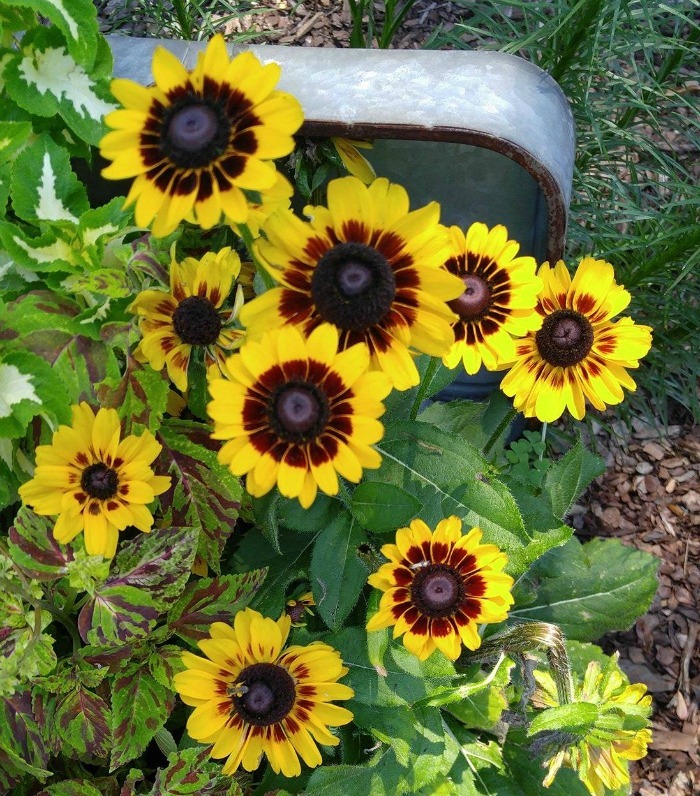 As far as easy care summer blooming plants go, nothing quite takes the heat and dryness of summer like a black eyed Susan (rudbeckia). They are profuse bloomers right into the fall months and require very little maintenance. They come in both standard sized and dwarf versions. Divide them every 3 or 4 years to keep them flowering vigorously.. Great for cut flowers and very hardy. This smaller variety is a new one that I tested this year, and I love it! It’s unusual to find blue flowers in the garden, so balloon flower (Platycodon grandiflorus) is a welcome guest. 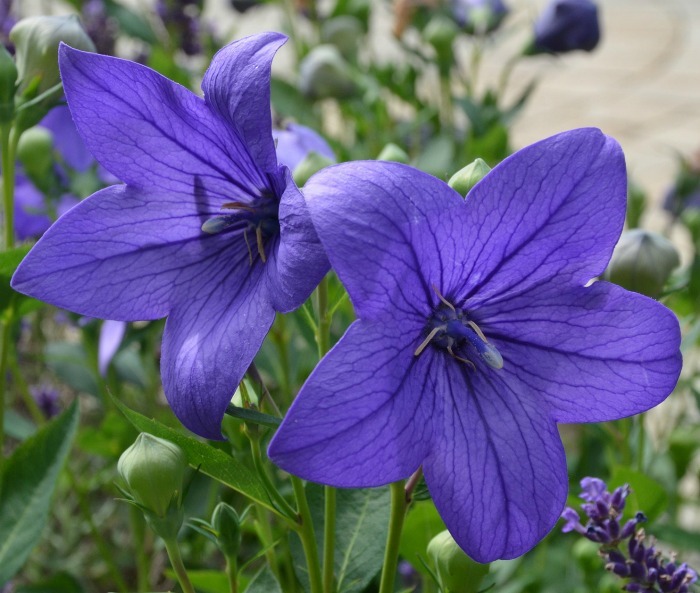 It does come in other shades such as white and pink, but blue is the most popular balloon flower. Give it full sun and watch it bloom from mid to late summer. 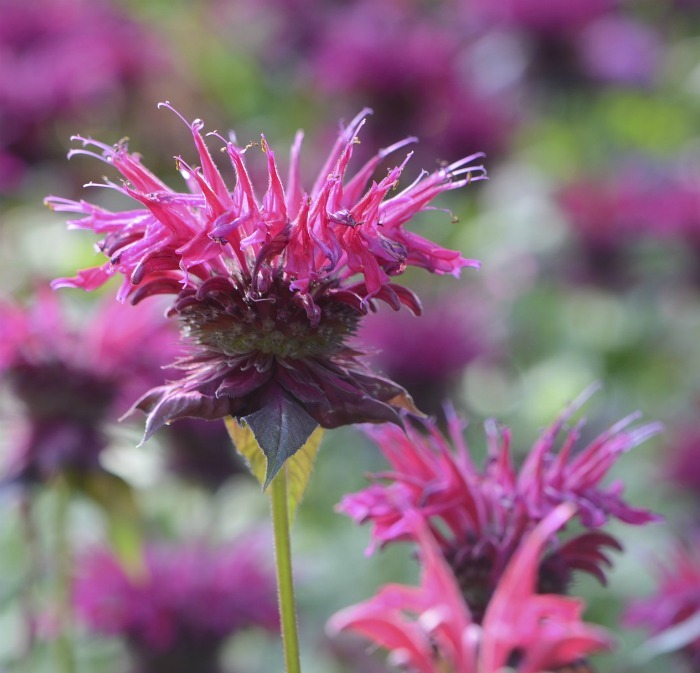 If you want to see hummingbirds and butterflies in your garden, bee balm (monarda)is a must have plant. It will flower from mid summer until fall and needs full sun. 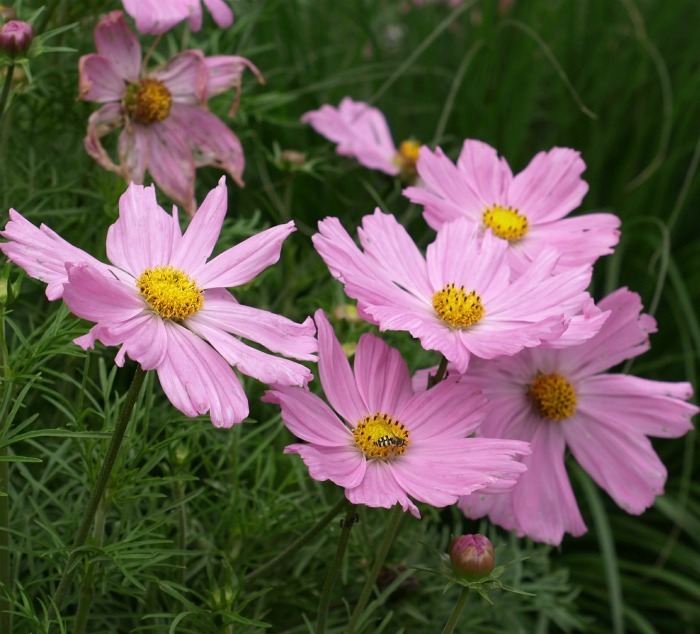 Hardy in zones 3-8, divide clumps in early spring to keep it flowering well. Gaillardia is an easy to grow plant that doesn’t mind dry feet. Its cheery flowers come in vibrant red, yellow and orange shades as well as combinations of them. Blanket flower reseeds readily and has a long lasting bloom time. Be sure to give it well draining soil. 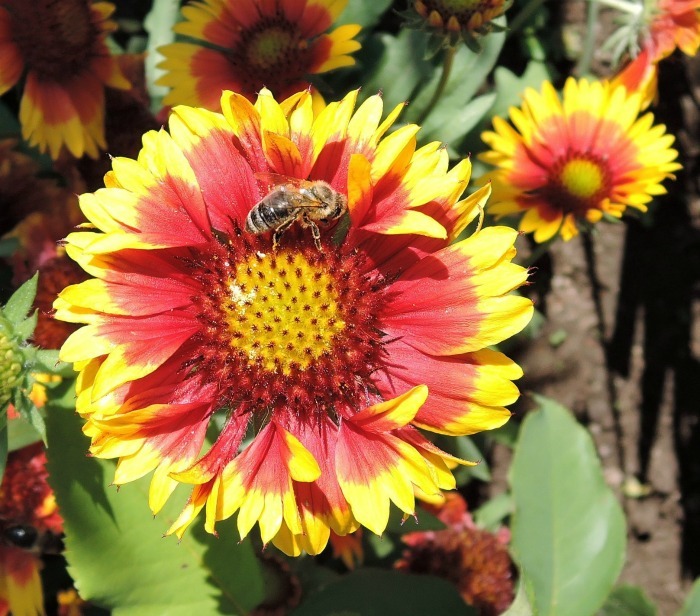 See my tips for growing blanket flower here. 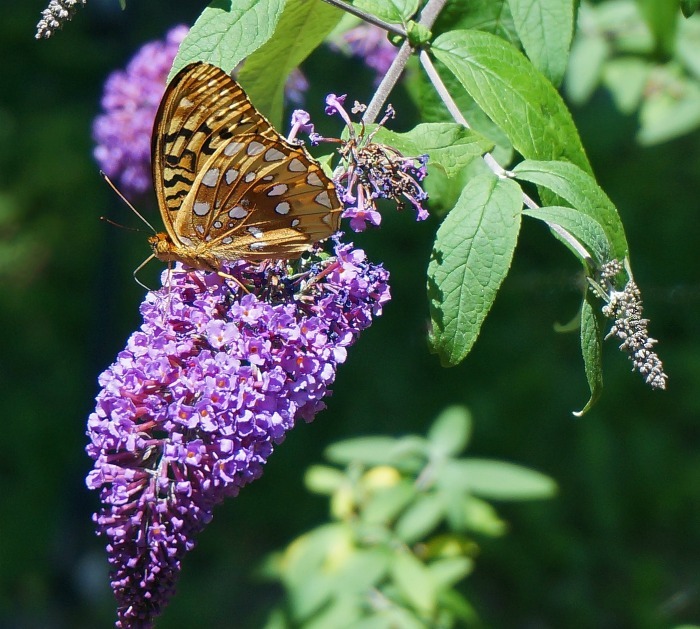 Butterfly bushes (buddleja) produce long lasting flowers that the butterflies just cannot resist. The flowers are large and fragrant and come in many colors. The plant is now being classified as invasive. To be honest, I have had the reverse situation in my garden with many butterfly bushes. I have to be really careful pruning it or it will die on me so I just leave it alone and it’s never been the slightest bit invasive. If you are looking for a reliable summer blooming plant that will bloom from early summer right into the fall, plant coneflowers (echinacea). They come in an array of colors and attract bees and butterflies in droves. Be sure to leave the last of the flower heads in late fall to attract birds. They love them! 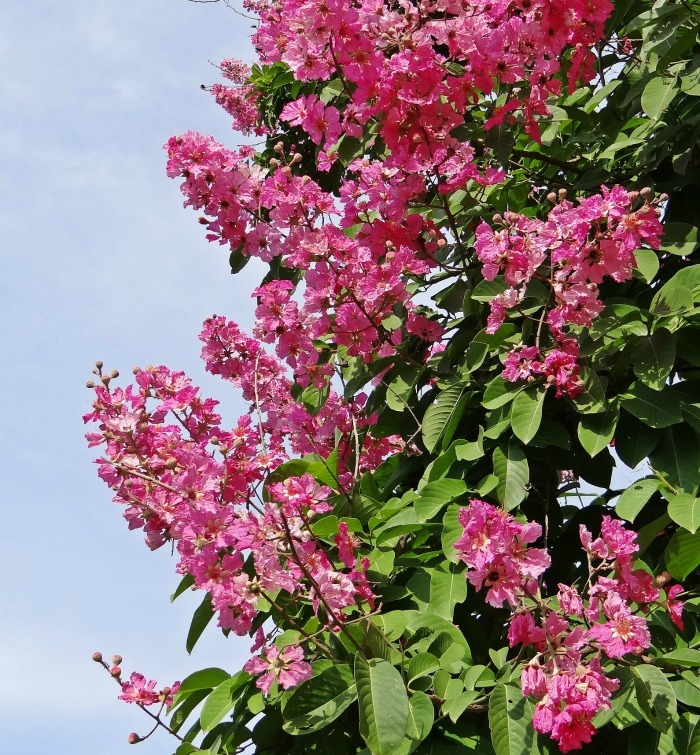 Here in North Carolina, the crape myrtle (Lagerstroemia) is grown everywhere. The tree forms large and very showy flower clusters from mid to late summer in blooms that range from white through to purple. It does best in full sun and can reach a height of up to 30 feet. Some dwarf varieties are also sold. The tree is hardy in zones 7-9. I have to admit that I have a soft spot for daylilies and all types of lilies, in general. 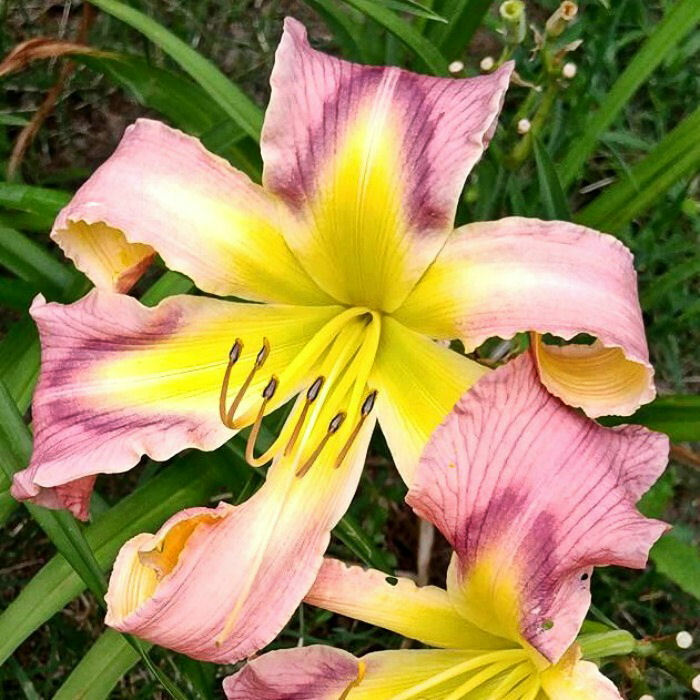 The flowers are amazing and if you plant daylilies, Asiatic lilies, or Oriental lilies and re-blooming daylilies, you will have color from early summer right through the fall. 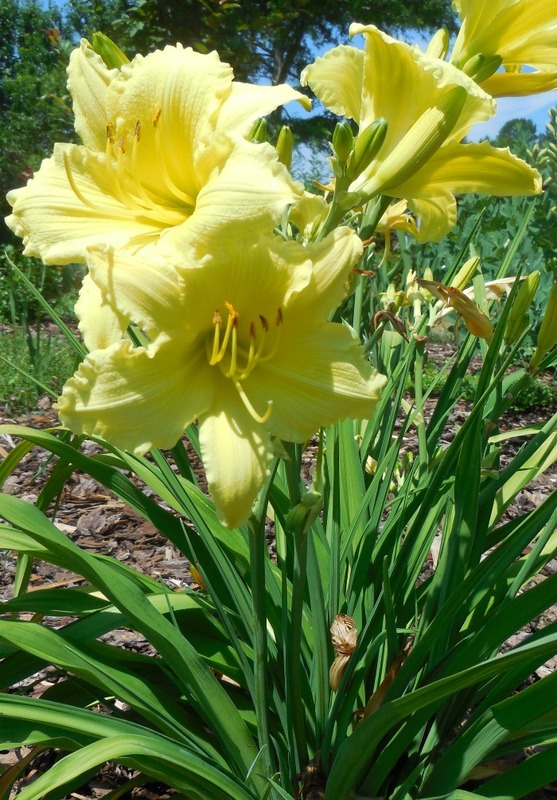 Daylilies are easy to care for, naturalize readily to give you more plants for free and look amazing in the garden. They are great for beginners, since they require little maintenance and are disease and insect resistant. Don’t know how to tell apart lilies? Find out the difference between Asiatic and Oriental lilies here. 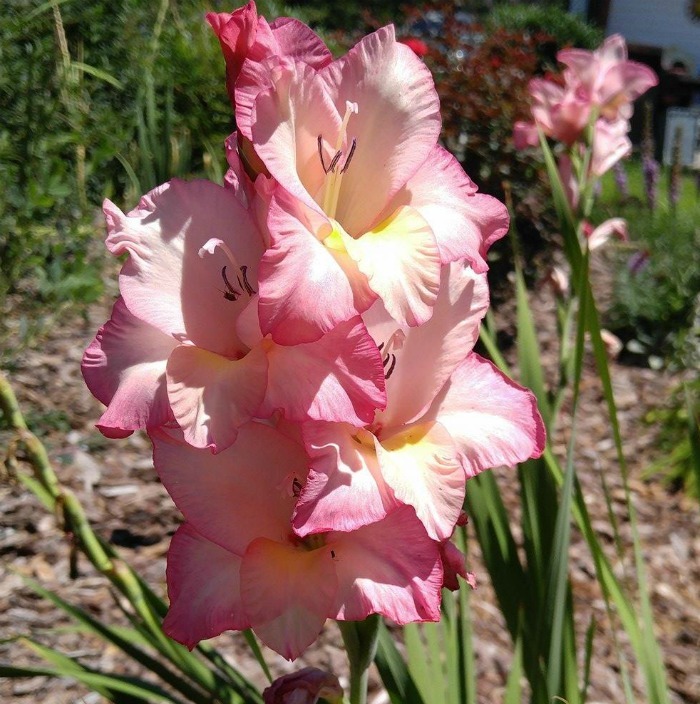 If you like cut flowers, try growing some gladioli. 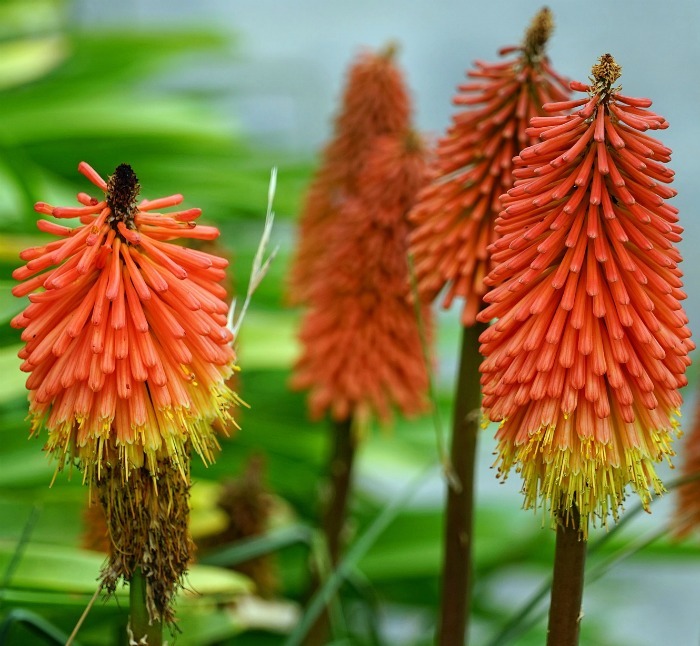 These perennial bulbs flower in early summer on very long stalks in a wide array of colors. In the garden, they need staking since the flower heads are heavy. Still need some more inspiration for summer blooming plants for your region? Here are more plants that will give your garden a colorful look all summer long. 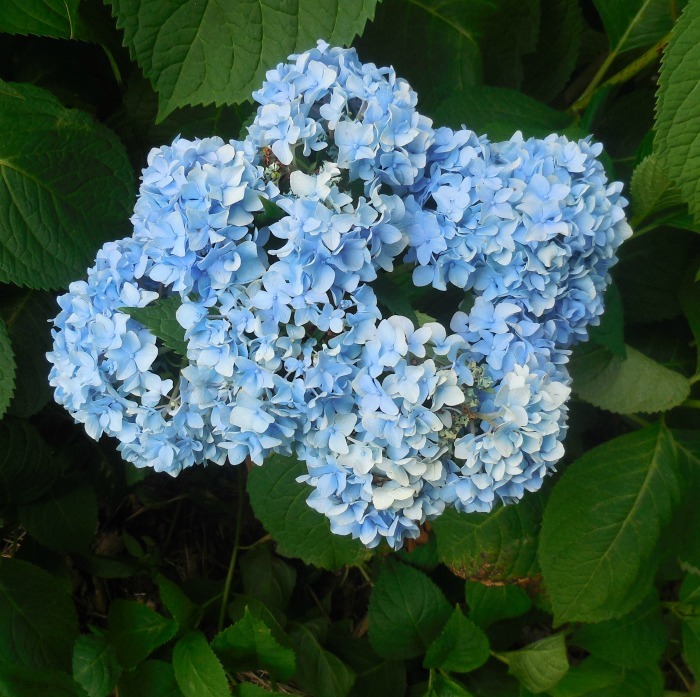 Everlasting Summer is one of the popular varieties of hydrangea for good reason. The blooms are very long lasting and just keep on flowering all summer long. 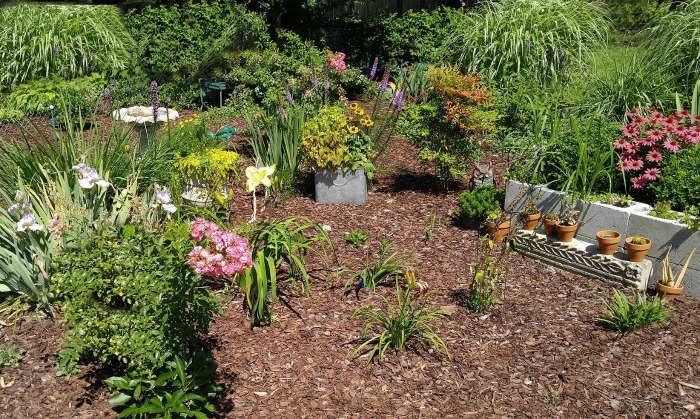 The flower colors may change depending on the soil acidity in your yard. Mine all turned blue in no time at all! This hardy succulent is better suited to more southern gardens, since it is really only hardy to zone 5. Here in North Carolina, my ice plants love the hot summer! 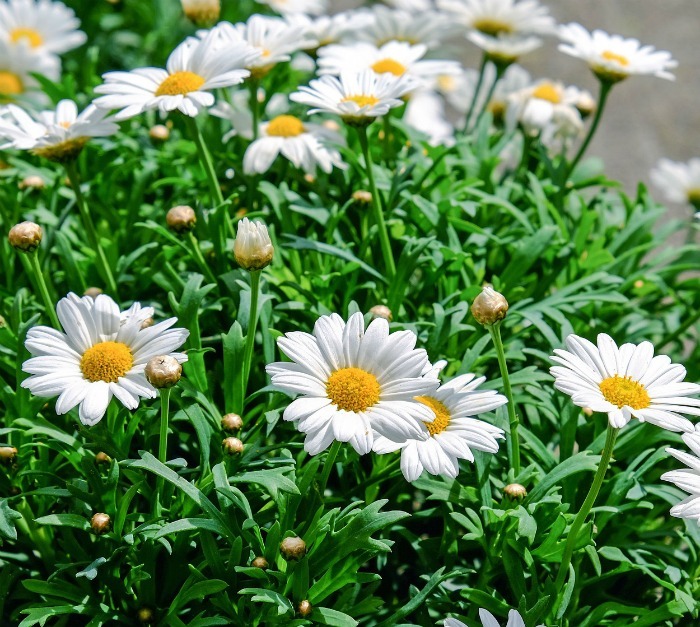 They are drought resistant, spread easily and produce bright daisy like flowers all summer long. 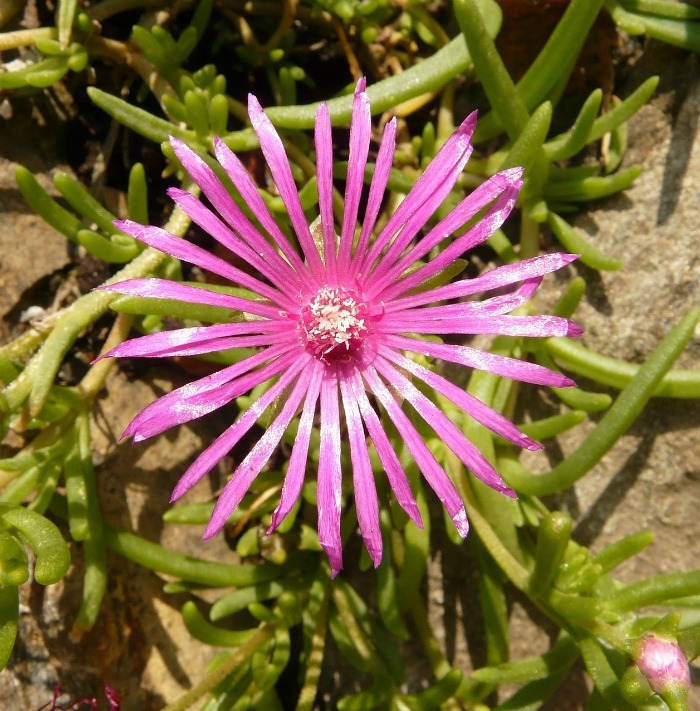 Delosperma is a ground cover succulent and will end up covering large areas of your garden bed easily. This stunning daylily gas cascading petals with blooms that can grow up to 7 inches across and will re-bloom. See how to grow daylily Earth Wind and Fire here.. 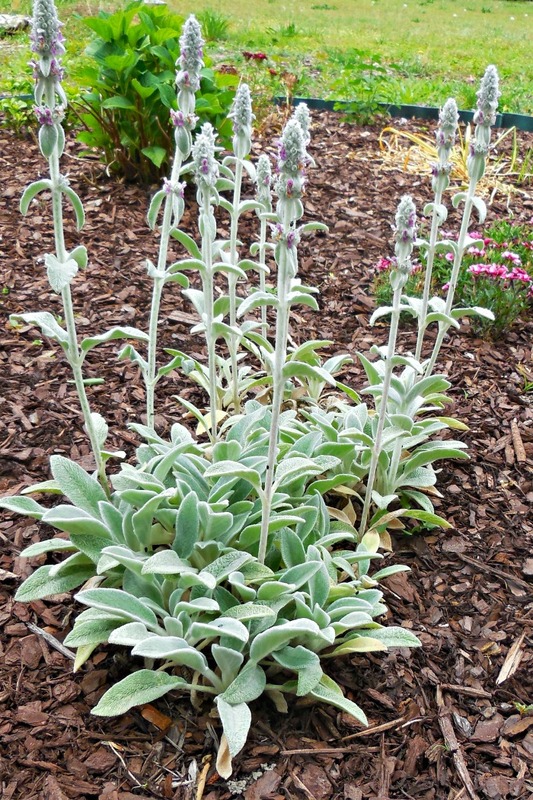 It is easy to see where stachys byzantina gets its common name lamb’s ear! The soft fuzzy leaves of this low growing perennial are shaped like those of a lamb. The flowers are borne on tall spires that appear early in the summer, and are quite long lasting. 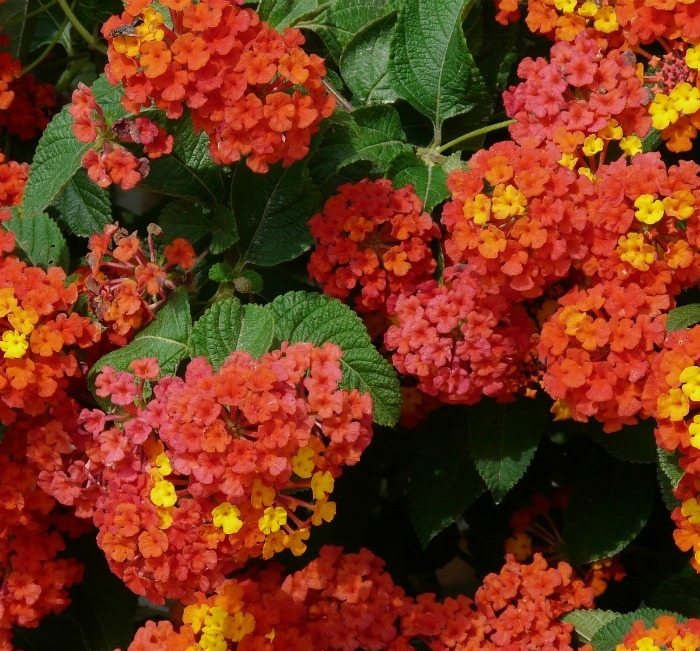 Drought tolerant lantana has a very long bloom time. The flowers come in a wide variety of colors as well as some bi-color versions. Be sure to dead head during the flowering season to make it bloom again. This perennial can grow in full sun as well as partial shade and is treated as an annual unless you are in zones 8-10. It is right at home in my NC garden and loves the heat, but I need to plant it each year! “Gayfeather” is the common name for liatris. With its tall sun loving stalks of purple flowers, this dazzling perennial creates a stunning visual in the mid summer garden. The spires multiply each year and can reach up to 4 feet tall. I started with a small cluster of them and have divided them several times and now have many four foot wide clumps of this amazing plant. 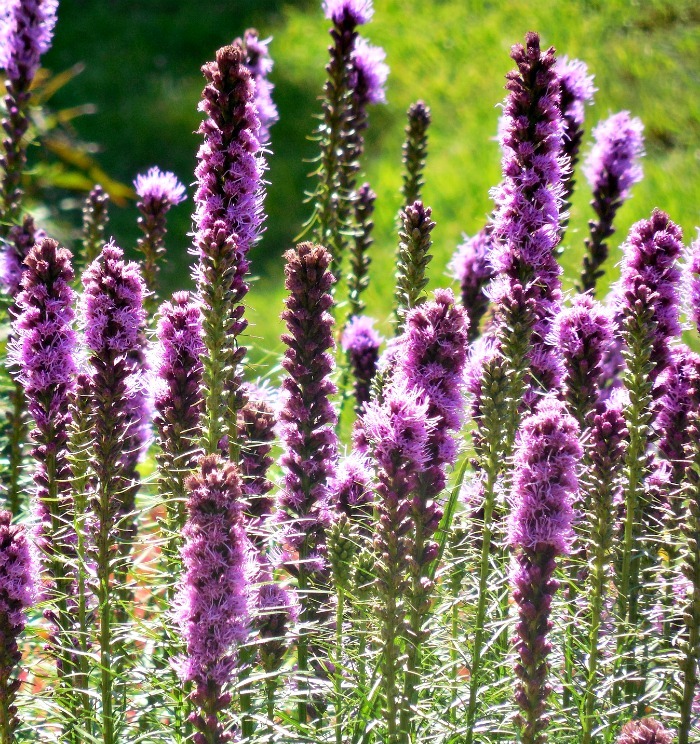 Liatris needs full sun and good air circulation to keep mildew from forming. It is hardy in zones 3 to 9. 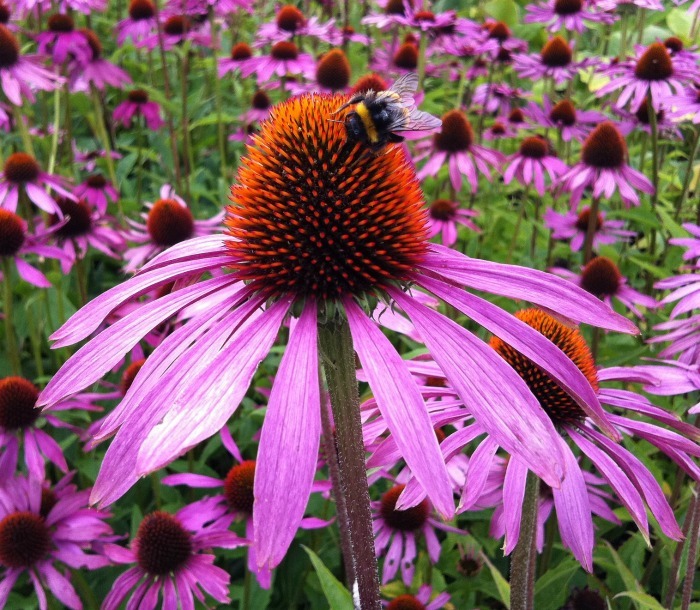 The perennial also comes in lavender, pink and white and is great at attracting butterflies and bees. 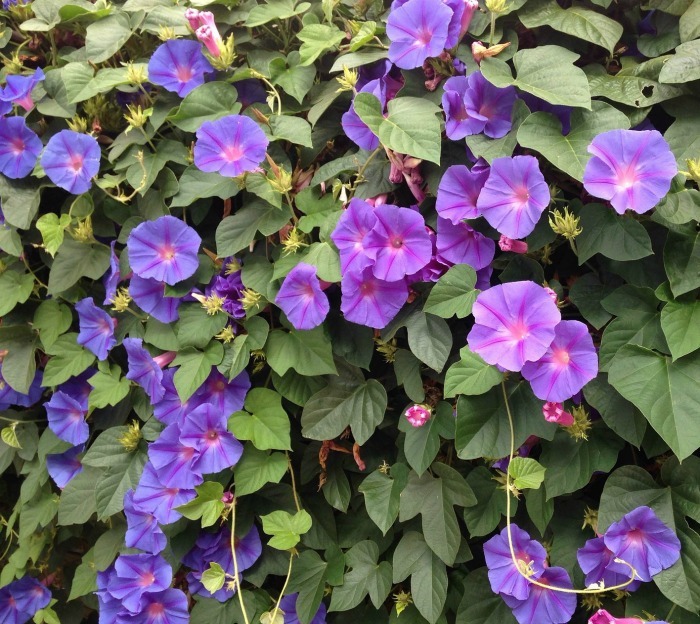 If you have a fence or post that you want to cover with flowers, grow morning glory (Ipomoea purpurea). This perennial is a fast growing vine with delicate flowers that last just for one day, hence the name “morning glory.” However the whole plant blooms from summer until fall. Just be sure to get out early in the day to enjoy them! The flowers are both single and double and very fragrant. The plant reseeds easily and is hardy in zones 3 – 10. 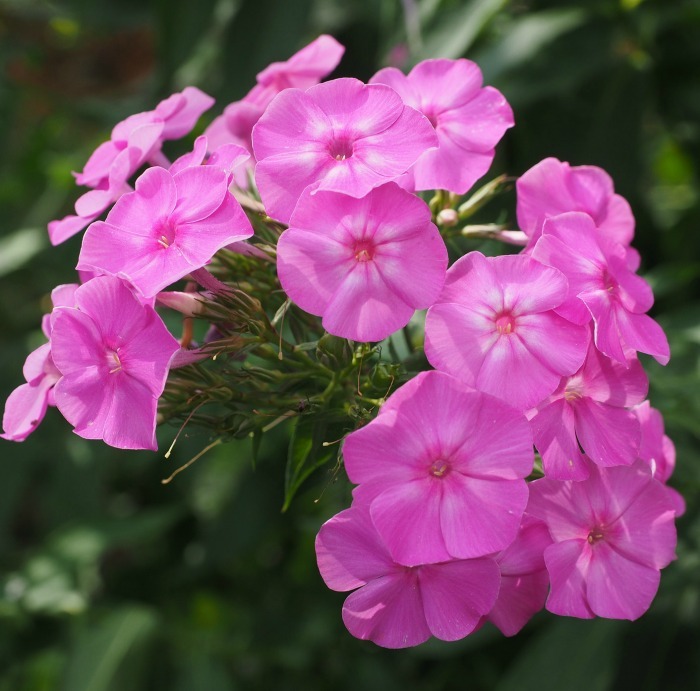 One of the pleasures of summer is phlox. 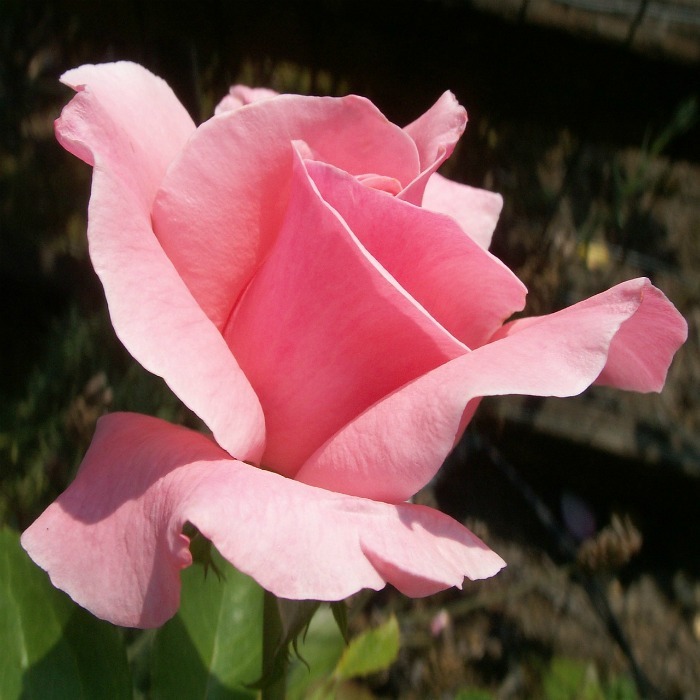 It is very fragrant and easy to care for and produces large blooms in a variety of colors. The flowers are perfect for bouquets and have a lovey scent. Be sure to give it extra water in on the hottest days. 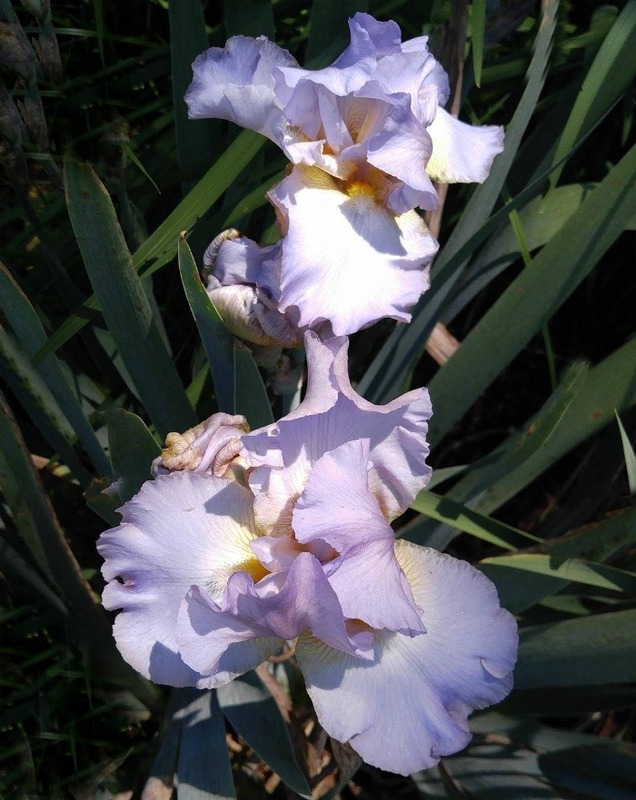 Most iris varieties are early spring bloomers but there are some re-blooming varieties of iris that keep on going right through the summer. This lovely light purple iris is a stunner in my garden right now. It requires very little care and gets bigger each year for me. If you want long lasting color from early spring right through the fall months, there is nothing that quite matches roses. Sure, they are covered in thorns and your summer will be spend dead heading them, but the color, variety and aroma of roses cannot be surpassed. From variegated varieties such as Osiria to pretty much every color of the rainbow, there is a rose variety for every gardener. One of the latest additions to my garden this year is Sedum Autumn Joy. This gorgeous plant with its waxy leaves will bloom right through fall and grows to about 2 feet tall. In late summer the plant bears large budded flower heads just waiting to erupt into bloom. It needs very little care and is generally deer resistant. 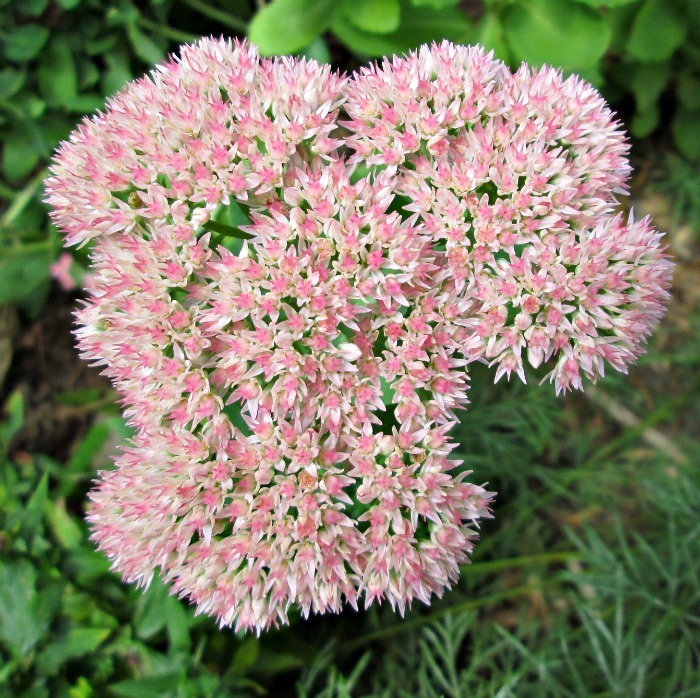 Sedum is great at attracting butterflies and is hardy in zones 3 – 10.. This sunny perennial is the perfect plant for those born in April – it is the birth flower for the month. Plant Shasta daisy (Leucanthemum superbum) in a sunny location and be sure to give it some extra water in the hottest weeks. The long stemmed flowers are perfect to bring indoors for arrangements. Shasta daisy will flower from early to late summer. See my tips for growing this pretty plant here. 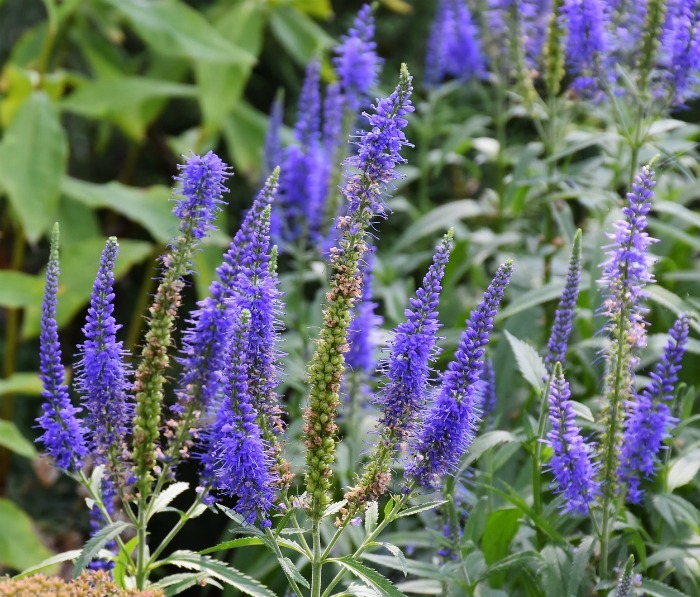 The tall flower stalks of Veronica (Veronica prostrata) come in many colors. As long as you dead head, this low growing ground cover plant will keep blooming through the summer. It likes full sun and needs extra water if you have several summer days without rain. The summer blooming plants that I have listed above are all perennials. They come back year after year. The following plants are annuals. You plant them once and they bloom just that year. But bloom they do! Since their growing season is short, they are a “bang for your buck” kind of plant. Add some of these annuals for loads of summer color. All forms of begonias will give color to the garden for months on end. I love that begonias self clean and don’t need dead heading to keep flowering. Tuberous begonias are my favorites, with angel wing begonias coming in a close second. 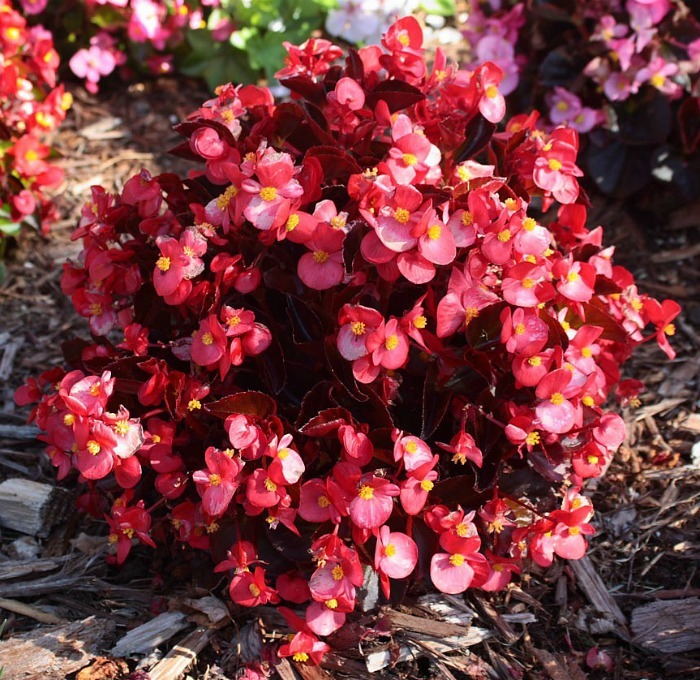 If you love long lasting color, give begonias a try. They are perfect for large planters, as border plants and in hanging baskets. While coleus does flower, the blooms are insignificant and I usually cut them off to encourage the whole plant to bush out. 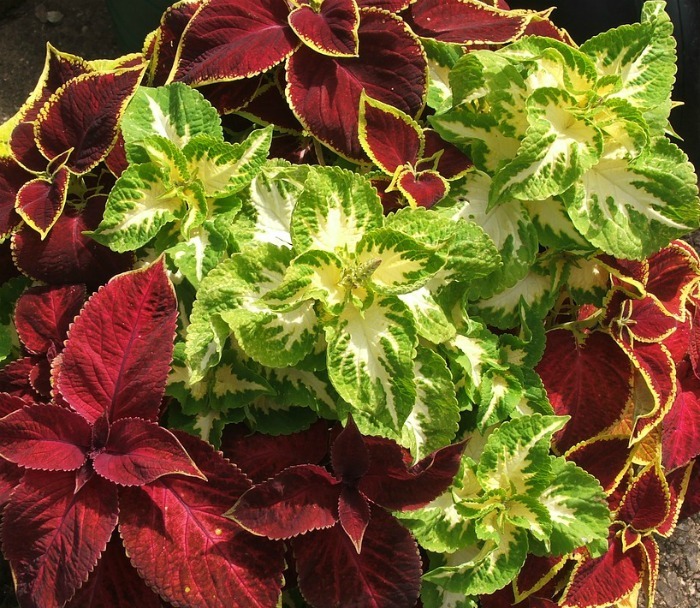 For me, coleus is grown for its amazing leaves that come in all colors of the rainbow. Cut off some growing tips late in the summer and bring them inside to root and enjoy as indoor plants for the winter. They root easily! Have a lot and dry summer where you live? Be sure to try growing cosmos. This easy to grow annual likes the drought! Colors range from pure white to a chocolate variety that is a perennial. Be sure to dead head to keep it flowering and use the cutting to root for more plants Butterflies love this plant that is only cold hardy in zones 10 and 11. To enjoy these lovely plants more than one year, they must be dug up in most growing zones. 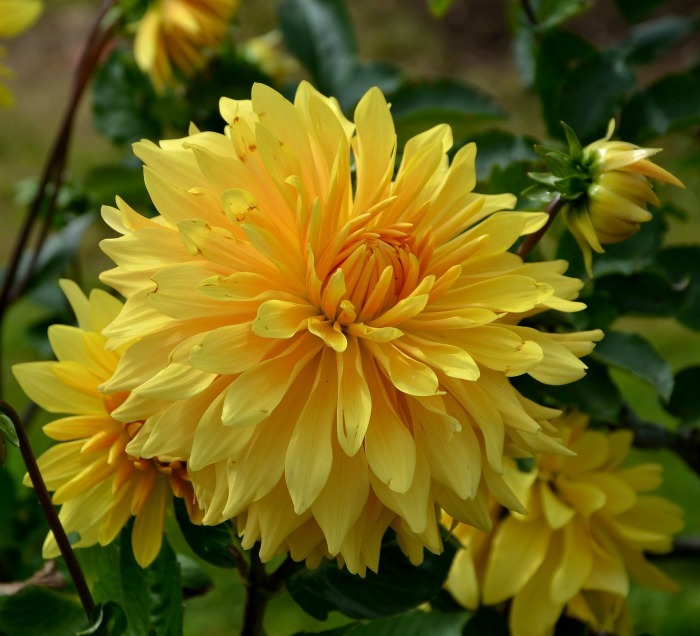 For most of the country, dahlias are considered annuals, but you can overwinter them pretty easily. In fall, cut off most of the top growth, and carefully dig the tubers and bring them indoors for the winter..It is worth the effort to enjoy these flowers for another year. I am in zone 7b and my dahlias won’t over winter so I consider them cold hardy only to zone 8. 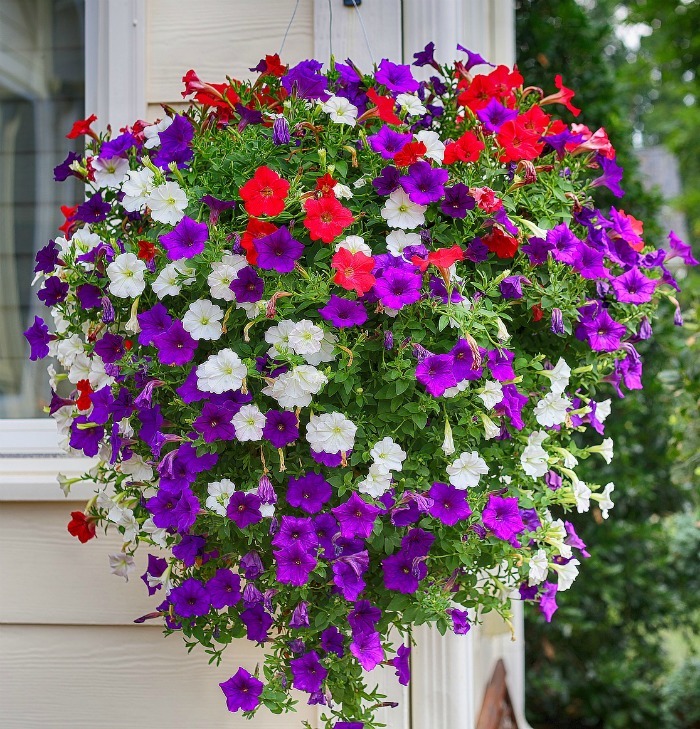 A popular bedding plant, petunias are also wonderful for hanging baskets. Remember to dead head the spent blooms and you’ll have a profusion of color all summer long. What summer garden would be complete without some sunflowers towering over it? The cheery flower heads can grow up to a foot across, so give them plenty of room to grow. 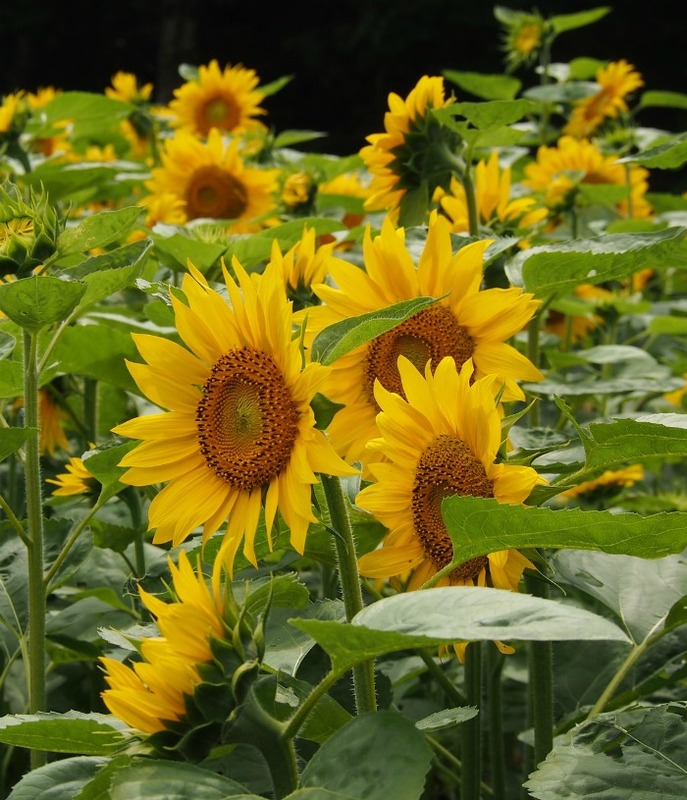 Sunflowers like to face the sun, so consider this when planting them. If you like to cut flowers to bring inside, grow zinnias. The bees and butterflies love them, and they come in a wide variety of colors. 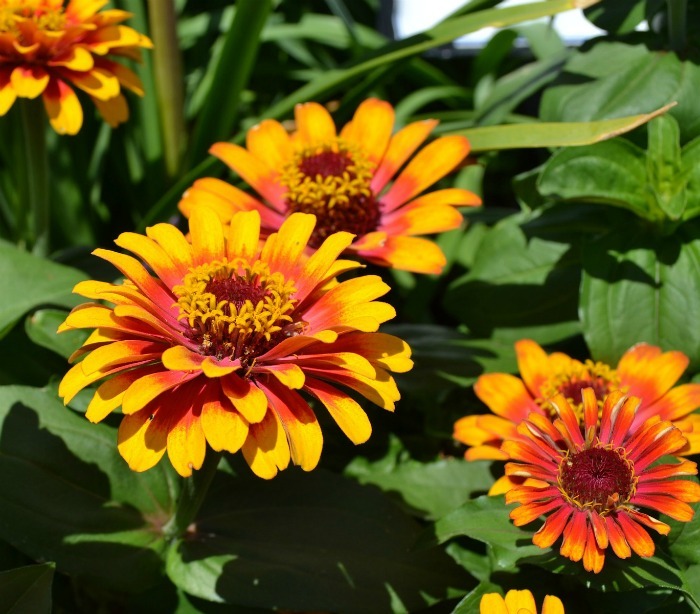 Zinnias thrive in hot weather and will bloom into the fall to give your late summer garden loads of color. With some careful planting and care taken to dead head flowers regularly, a collection of these summer blooming plants in your garden will give you color from early summer until well into the fall. Which summer blooming plants are must haves for you?